•Some algorithms that RivEX uses are sensitive to the digitising sequence of the network (i.e. the row order of the FeatureClass). This can generate unusual attribution with catchments that have multiple mouths. 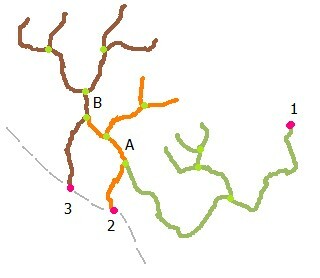 Multiple mouths can occur in karst regions or as channels feeding into man made water courses. These are legitimate parts of the network yet they can significantly alter the output by RivEX. •The force longest route option changes the behaviour of the algorithm and will influence any catchments with multiple mouths. This option is turned on as default but you you can choose to ignore it by simply un-ticking the check box. •To understand the influence of this option review the sequence of images below. 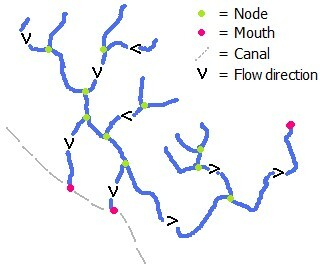 In this figure a network is shown with it's mouths, nodes, flow direction and a secondary dataset indicating the location of a canal. It is clear that there are 2 channels feeding the canal. The same network is shown but the order the polylines were digitised are marked by the numbers. The upstream ID algorithm will start processing each ID in this order. Do the polylines above node A belong to catch 1 or 2 and do the polylines above node B belong to 1, 2 or 3? With force longest route TURNED OFF the results are as below, this is clearly not correct (but can be useful in identifying network errors). If you were using distance to mouth in your analyses then a survey site located anywhere upstream of A would be giving a false value (yet it drains to an acceptable mouth). With force longest route TURNED ON the results are as below. These results make much more sense, the polylines upstream of nodes A & B are draining to the mouth furthest away. Distance to mouth would be more meaningful in your analyses.